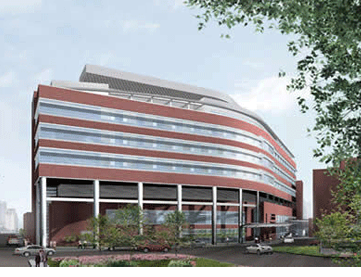 Block Electric Company worked with Walsh/DeMaria as the electrical subcontractor on the US Department of Veteran Affairs’ Jesse Brown VA Medical Center. The electrical contract was let because of the complicated existing conditions at the site. Three buildings needed new medium voltage services from the central plant before demolition of the existing buildings could begin. The problem was that the structures to be demolished lay between the central plant and the buildings to be re-fed. Boring deep under the existing structures solved the problem. It took extensive planning to assure the new underground duct banks would not interfere with the new hospital construction.